Although the UK has some if the longest working hours in Europe, Britons also know how to play hard. We have conducted extensive research into the online gambling industry. This has included branding, customer retention, customer loyalty and research with affiliates. "What a wonderful service! Approachable, professional, knowledgeable and enthusiastic. Quick turn-around time on projects, and excellent quality of results. DJS comes highly recommended!" The research included a mix of on site and off site qualitative research (groups, depths, triads) and quantitative research. For the National Association for Sports Development (NASD) we have conducted a number of user and non-user surveys to help them understand their audience. They said. "DJS responded to our query promptly and comprehensively. Danny dealt with us personally and was careful to ensure he fully understood our requirements. The work was completed to time and to a high standard and the research report was clear and succinct"
We have also undertaken work for Glossop Rugby Union Football Club. Mick Owen - Head of Coaching at Glossop said. "Working with Danny was a joy from start to finish. He took care to make sure that the consultation asked the questions we needed to ask; was energetic and enthusiastic throughout the process; didn't make a single promise that he couldn't keep and delivered the feedback, which was quite challenging for some of us, in a sensitive but professional way"
If you require any further general information about the topic of Market Research, as well as http://www.djsresearch.com/ you may also want to try. 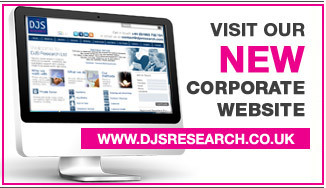 http://www.marketresearchworld.net/ - a useful market research resource.